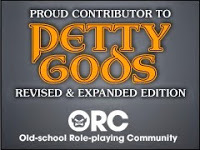 Continuing with the recent theme I have another rules-lite RPG. This one, Barbarians of Lemuria, hearkens back to the age of pulp fiction with the likes of Appendix N writer Lin Carter. 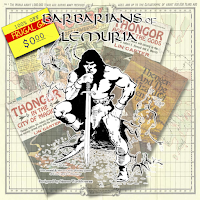 Set in the world of Thongar the Barbarian, which was the protagonist of a series of books and some Marvel comics, Barbarians of Lemuria is a 43 page PDF that covers player's handbook, GM book, sourcebooks....everything. There is an ancillary document that is barely more than a page which adds two more "stats" for the game and there are a couple of PC sheets. If you fancy a Conan-ish rules-light game and don't mind learning the background of the setting, which seems to be an integral part of the game, then you might want to pick up the Barbarians of Lemuria. I was particularly impressed by the simplicity of the magic system.